The idea of freedom of movement with everything to hand inspired this unique designer kitchen in Greater Manchester. 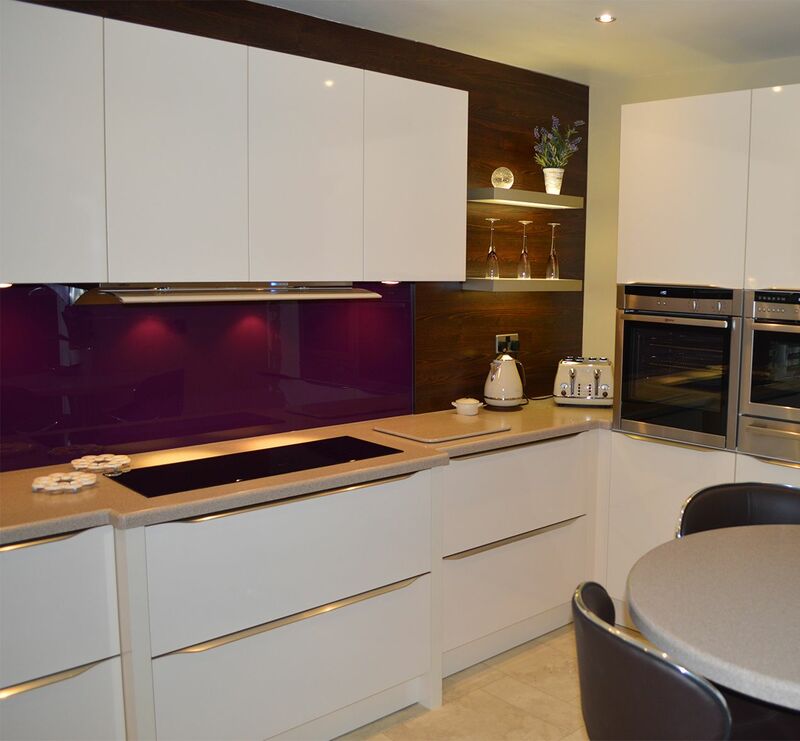 Although the property, in Bowdon, was relatively modern, the kitchen has been brought even more up-to-date with an innovative design from Kitchen Design Centre. 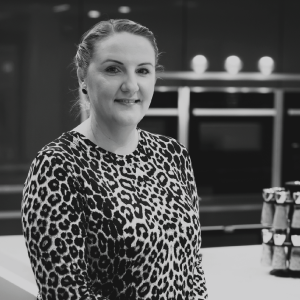 “I was asked to design a kitchen with visual impact but it also had to be very practical from a cooking point of view, especially because the owners love cooking for all the family.” said designer Suzanne. The interior design of the existing extension didn’t blend in with the room as a whole – so the kitchen needed a complete revamp and different approach. The couple owning the property had looked around for a scheme to suit their needs but weren’t satisfied with anything they had seen. A friend suggested they pay a visit to the Kitchen Design Centre Manchester showroom. “We started talking and it became clear that they wanted something with a real contemporary edge that would stand the test of time,” recalls Suzanne. 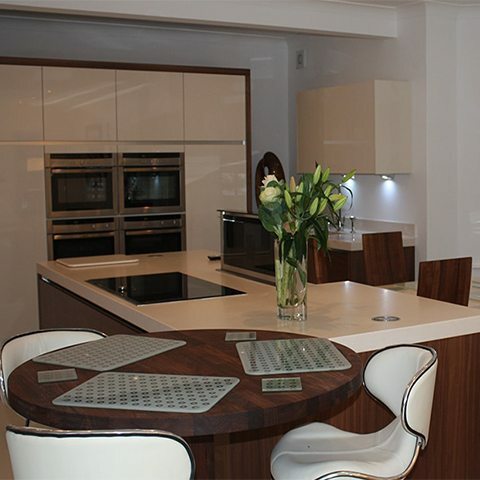 Suzanne suggested a mix of smooth Corian and cabinets with a walnut finish. The colours bring a sense of warmth and prevent a cold clinical look. The layout was the next consideration, with the focal point being the central island. While the design of the central island incorporates a breakfast bar, the couple also wanted a separate dining table. In response to this, Suzanne designed one to attach to it, using the same materials. The “downturned Corian table” is a unique creation, and a rare and innovative design element. Designed for preparation and serving meals, the central island is complete with a powerful induction hob as well as a downdraft extractor, which is discreetly hidden and rises out of the island when needed. The induction hob is ideal for fast, flame free cooking – faster than gas and much more efficient than ceramic, halogen or solid plate hobs because of its instantaneous heating and cooling, with lower running costs. “It’s so fast and easy to clean,” the couple said, “and the downdraft extractor is discreet, stylish and powerful. The kitchen also includes an innovative Quooker boiling water tap. This provides both instant boiling, great for making quick drinks or boiling water for food preparation. In addition, there are four built-in ovens, positioned directly next to each other, including a compact oven and microwave. 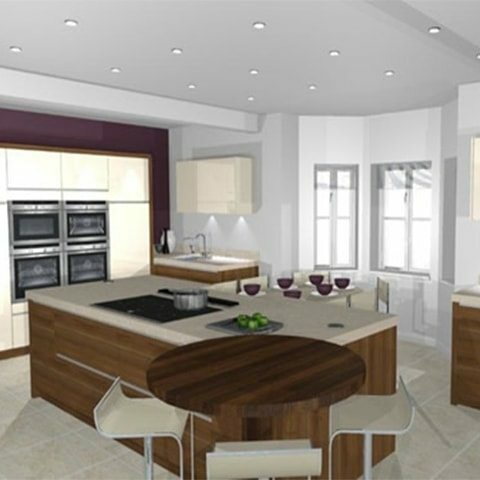 With a few more suggestions from Suzanne to create the perfect kitchen design, such as a round table overlooking the breakfast bar and a wall mounted digital TV across from the dining area, Kitchen Design Centre made the couple’s ideas and needs a reality. 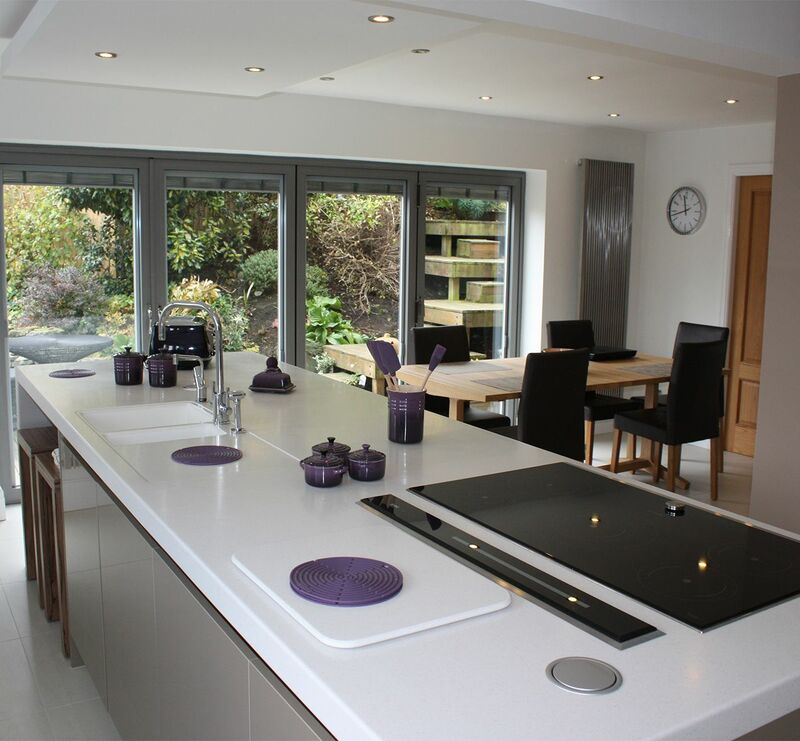 The end result was a superb German handle-less kitchen – bright, airy spacious and pleasure to work in. 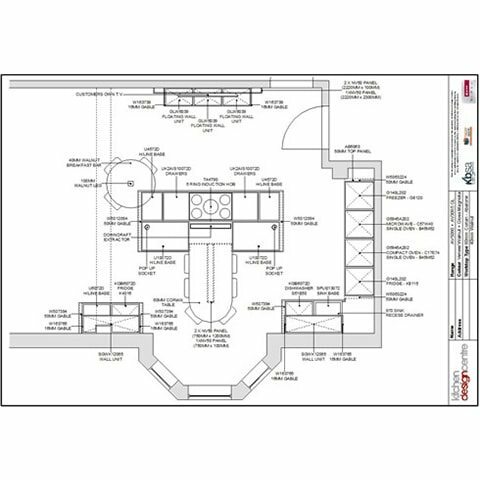 “Kitchen Design Centre was helpful, fast, efficient and very accommodating to anything extra that we wanted.” the couple said. 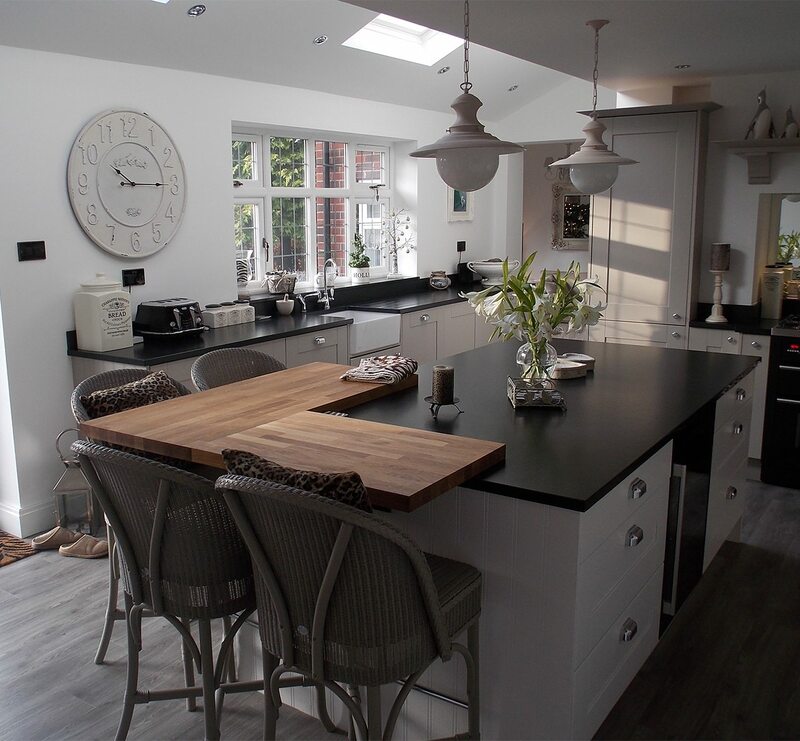 “We love our new kitchen and it was fantastic to work with both the designer and fitter. "It’s a large home with lots of space, including a living room and dining room, but the kitchen is now the hub of this home"
"I was asked to design a kitchen with visual impact but it also had to be very practical from a cooking point of view, especially because the owners love cooking for all the family."